Maximize your strength training, HIIT workout, handstand to headstand routine, yoga arm balance practice, bodyweight or CrossFit circuits with our Body Power Parallettes. 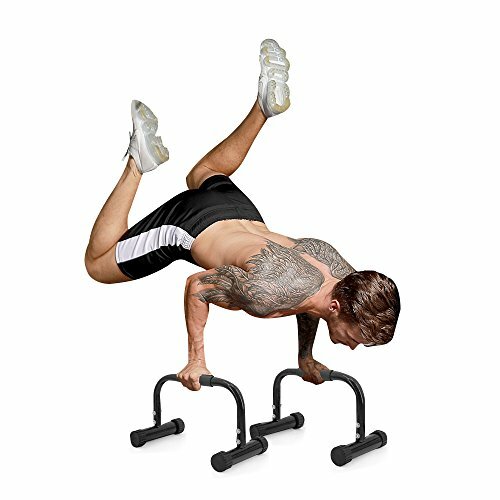 These easy to assemble and high quality elevated push up bars are ultimate strength training equipment tools for muscle development and toning. ✮SUPERIOR QUALITY & SLIP-RESISTANT ✮ - 5Billion Push Up Bars are made of high quality polypropylene, which is sturdy and strong enough to support any weight. The handles of the bars are covered by foam, which is soft and sweat-absorbent. It will provide you with a comfortable and safe grip. ✮ BUILD UP MUSCLES ✮ - Push up bars are ideal for muscle training. By working out with push up bars, such as doing push ups and cardio workouts, your chest muscles, triceps, abdominal muscles and back muscles can be trained effectively. ✮ ERGONOMICAL DESIGN PROTECTS WRIST ✮ - The I-shaped design of push up bars can protect your wrist from hurt or injury during the workout. The bars increase the range of motion during push ups. It will make push ups easier and safe. ✮ LIGHTWEIGHT & EASILY DISASSEMBLE ✮ - The push up bars are light weight, and can be easily assembled and disassembled. This makes it convenient to take them to gyms or outdoor, and easy to store. Free work out guide will be shipped together with the push up bars. It can assist you to try various training modes correctly. ✮ Please allow measuring deviation due to manual measurement. If you have any questions about this product by Helang, contact us by completing and submitting the form below. If you are looking for a specif part number, please include it with your message.